If you love a combination of sweet and savory flavors in your Thanksgiving turkey, this recipe is for you. Cranberry glaze puts the finishing touch on the bird and gives it that gourmet look that will make everyone think you slaved over it, even though it really doesn't take that much extra effort to prepare. First prepare your turkey following the instructions below, and then put it in the oven to roast. About one hour before its cooking time is over, begin preparing the cranberry glaze and coat the turkey with it as directed. To round out the perfect meal, add side dishes such as sweet potato souffle, a delicious corn pudding, and savory green bean casserole. In a small dish, use a fork to work the softened butter and poultry seasoning together until well mixed. Wash the turkey and pat it dry. Gently separate the skin from the breast using your hand, and rub some of the seasoned butter on the flesh beneath the skin. Smooth the skin back down, and rub the butter over the entire outside of the bird, as well as inside the cavity. Stuffing the turkey is optional. If you plan to stuff the bird's cavity, do so before putting it in the oven, and cover any exposed stuffing with a piece of heavy-duty foil. Spray an appropriately-sized roasting pan and rack with nonstick cooking spray, place the turkey on the rack, and put the pan inside the oven. Immediately turn the oven down to 350 degrees Fahrenheit, and do not open the oven for another 25 minutes. After 25 minutes, you can begin basting the turkey with its own drippings throughout the cooking process until it's time for glazing. 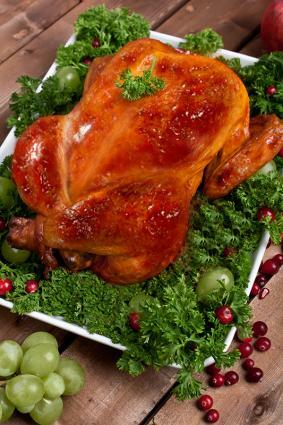 Roast the turkey approximately 20 minutes per pound if not stuffed, and about 25 minutes per pound if stuffed. It's finished when the popper pops or when the internal temperature of the fattest part of the thigh reaches 180 degrees Fahrenheit. If stuffed, the stuffing should reach an internal temperature of 165 degrees Fahrenheit. Glazing will take place during the last 30 minutes of roasting, as directed below. In a small, heavy saucepan, combine the jellied cranberries, orange juice, and brown sugar. Heat over medium heat, stirring slowly and constantly until the jelly begins to melt. Adjust the heat to medium high, bring the mixture to a boil, and continue stirring. Once the mix reaches a boil, reduce the heat to a simmer, and continue cooking for about eight to 10 minutes. Stir occasionally to keep the mixture from sticking to the bottom and sides of the pan. Brush a coating of glaze on the turkey during the last 30 minutes of cooking. Close the oven and let the glaze cook on the turkey for about 10 to 12 minutes. Brush on a second coating of glaze, and continue cooking until the turkey is done according to the directions above. A beautiful turkey deserves a lovely presentation. Fill the outer edges of your platter with curly parsley, and then lay the turkey in the middle. Tuck raw cranberries, grapes, oranges slices, and any other food items you like all around in the parsley until you feel everything looks just right. Once you're finished, it's time to present your magnificent culinary achievement to all your hungry admirers.